A New and Accurate Map of the Seven United Province. A Chart of part of the Sea Coast of England, Holland, Zeeland and Flanders, shewing the Sandy Soundings, Bearings etc. 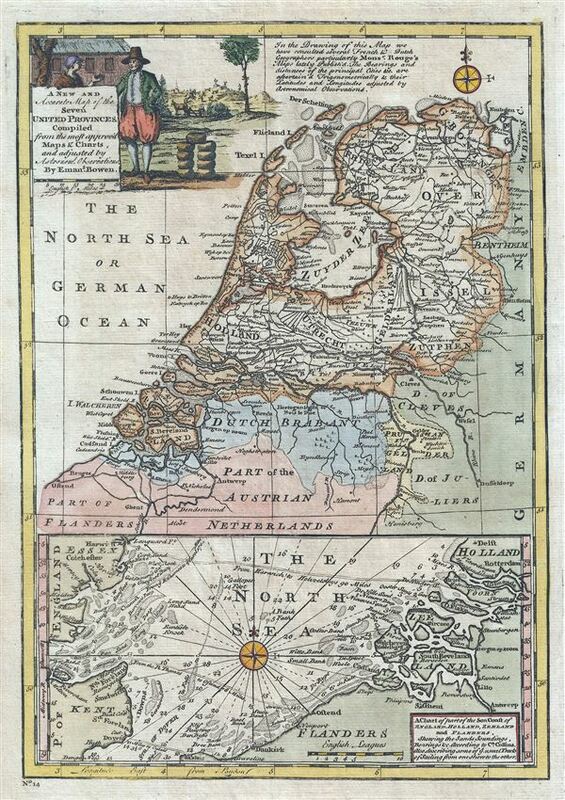 This is a beautiful 1747 map of Holland or the Netherlands by the British cartographer Emanuel Bowen. Essentially two maps on a single sheet, the top map depicts all of modern day Netherlands along with the northern parts of Belgium. Several towns, cities, rivers, lakes, roads and a host of additional topographical features are noted throughout, with mountains beautifully rendered in profile. The bottom map depicts the North Sea with the eastern coast of England and the western coast of Belgium and the Netherlands. The region at the time this map was made was known as the 'Republic of the Seven United Provinces.' Officially recognized in the Peace of Westphalia in 1648, the Republic of the United Provinces lasted until 1794, when Napoleonic forces invaded and set up a new French client state, the Batavian Republic. After Napoleon's fall in 1815, the Congress of Vienna united these provinces with the Low Countries to the south to form the United Kingdom of the Netherlands. The Netherlands, with the world's first stock exchange, is considered to be the birthplace of the modern capitalist economy. The lower map features a nautical chart of the eastern coast of England and the western coast of the Netherlands and Belgium. This chart notes coastal cities, shoals and islands. Rhumb lines and soundings are present throughout. A beautiful title cartouche adorns the top left quadrant of the map, illustrating a scene with a man and woman in traditional outfits. This map was prepares by Emanuel Bowen as plate no. 14 for the 1747 issue of A Complete System of Geography.